Housing: Where will the NDP lead us in the next four years? Start with an ageing housing stock and deteriorating housing conditions. Add shock evictions, growing waitlists, and negligent landlords. Throw in renovictions and gentrification creeping into almost every corner of the city. On top of that, add run-of-the-mill rent increases for people earning stagnant wages, expiries of operating agreements for non-profit housing providers and co-ops, and a precipitous decline in the number of non-market housing units in British Columbia. Top it off with over-capacity shelters and shelter closures, single mothers in the streets, and shelters that won’t take in families. This is where we’re at in British Columbia. These are the ingredients for a world class housing crisis. British Columbians are by now familiar with hearing that their housing costs are the highest in the world. Any way you look at it, BC is experience the worst housing crisis in its history. When the former UN Rapporteur on Housing visited Vancouver last year, he observed that “not much has changed” since his previous visit in 2007 when he declared a national emergency in the state of housing and homelessness. These conditions have inspired a Social Housing Coalition and even acts of civil disobedience. Most notably, a resident has been on hunger strike since March 22nd to stop gentrification and draw attention to housing rights in the Downtown Eastside. And for good reason. We’ve gone astray. The Universal Declaration of Human Rights declares that: “Everyone has the right to a standard of living adequate for the health and well-being of himself and of his family, including…housing.” And yet, at any given moment in British Columbia, thousands of people are on the verge of eviction and personal bankruptcy. Household debt is higher in Canada than it has ever been, reaching 163% earlier this year. While corporate taxes are rock-bottom after ten years of BC Liberal tax cuts, BC has the highest consumer debt in the country. Services have been slashed and austerity measures have made it all but impossible for the average person to expect stability in the event that they’re laid off or evicted from the increasingly-precarious market housing. NDP’s housing platform: More austerity measures? In the midst of the current provincial election, housing is not only on people’s minds but also on politicians’ mandates. 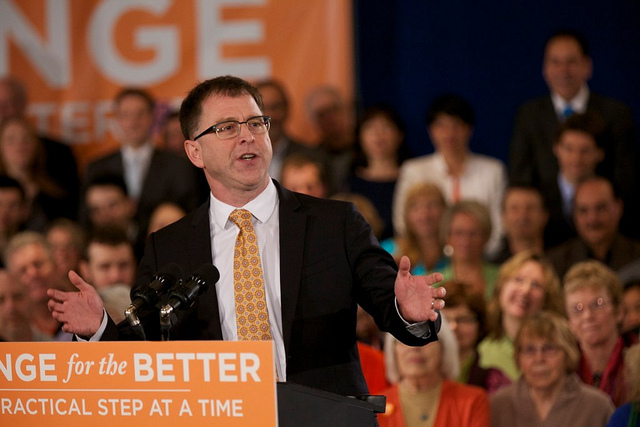 With the nearly-guaranteed election of Adrian Dix and an NDP government next month, a flicker of hope is felt. But what exactly is being promised in order to reverse the crisis? Will NDP policies improve the state we’re in? The current NDP critic for Housing, Construction and Business Investment, Joe Trasolini – a real-estate investor and Christy Clark’s co-chair on her 1996 leadership campaign – assures us that his party has a strategy, even if they haven’t spelled out any details. The NDP has announced its fiscal plan, indicating that their priority is to reduce the deficit left by the BC Liberals. Yet it seems the party has proposed the impossible, declaring they want to pay down the deficit without any significant tax increases. The NDP’s attempt to “convey business savvy,” as Charlie Smith put it, will come at a major social cost. It appears that the budget deficit may be stabilized under an NDP government, but at the expense of prolonging a growing “social housing deficit.” It costs almost twice as much money to keep people in poverty than it does to house them. The Canadian Centre for Policy Alternatives has estimated that a comprehensive B.C. “poverty reduction” plan would cost between $3 and $4 billion. This may seem like a lot of money at first glance, but that’s before noting that the cost of a society without adequate housing is actually much higher, at around $8 or $9 billion. A 2012 Canadian Homelessness Research Network report, written by Stephen Gaetz, makes the case in these terms: “[I]nvesting in rehousing people who are already homeless is both humane, and cost effective,” writes Gaetz. “For instance, there is considerable evidence that Housing First approaches, even though they involve rent subsidies and in some cases intensive case management, can save money.” So, it is likely that the austerity agenda will prove incapable of obtaining either budgetary goals or housing equality. This will perpetuate a growing reliance on emergency shelters and unnecessary hospital expenses, where jails and police budgets will continue to expand in an unjust system that imprisons the poor on a daily basis. Alarmingly, Adrian Dix has dismissed social housing as a “big-box” solution that the province currently cannot afford. NDP MLA Shane Simpson has similarly called for “creative solutions” to the housing crisis, referring to big social housing spending as a “one-off” proposal that no longer truly fits our economy. Housing is the largest single expense for British Columbians, and since housing prices have skyrocketed — giving private housing developers record profits — it is difficult to see how non-profit housing solutions would fail to help lift people out of poverty. Recently Adrian Dix was asked if his government would bolster the RTA’s existing rent-control mechanisms for privately-owned apartments. “We can’t do something that will discourage developers from building the rental housing people in this province need,” Dix responded. While the argument might sound like it’s drafted by the Fraser Institute, the reality is that this has been the position of another government for years: Vancouver’s two-term Vision administration. Trasolini has conveyed the same pro-market approach as Vision Vancouver when it comes to housing. In particular, Trasolini has echoed Vision Vancouver’s trickle-down analysis that any new market housing, no matter what its market price, can be expected to relieve affordability pressures. In Trasolini’s free-market analysis, “Whenever there is supply that comes on the market, it relieves the pressure on vacancy.” And since low vacancies are supposedly a sign that the market is being held back by government, the role of an elected NDP government will be to step back and let the forces of supply and demand solve the housing crisis. On the one hand this rhetoric helps the NDP speak the corporate language it aspires to, while on the other hand it obfuscates the actual functioning of the current housing market, particularly the internal supply control mechanisms of the corporate housing monopoly. Despite similarities there is a difference between Vision and the NDP. While the political elites from both parties are mostly overlapping, Vision has been defending austerity and free-market neoliberalism on grounds that “senior levels of government are currently not funding housing.” With a BC Liberal government sitting next to a federal Conservative government, this argument has seemed half-plausible ever since the election of Vision in 2008. Now that the NDP is poised to take power, the bluff has been called on the Vision-NDP buck-passing. Yet it seems that the practice of buck-passing remains widespread and will continue. Recently Joey Hartman, President of the Vancouver and District Labour Council, told a delegation from the BC Social Housing Coalition that social housing is a federal rather than provincial responsibility. For years VDLC members have been told by Hartman and Vision that the municipal party can’t build housing because it’s a provincial and federal responsibility. Now Hartman is suddenly found narrowing the possibilities for change, proposing instead that housing should only be Stephen Harper’s job. When it comes to housing, it is difficult to see how the NDP is truly different than their predecessor and their municipal counterparts. We have to unpack the rhetoric and recognize the fact that another four years of neoliberal government is potentially at the doorstep. “You can’t just leave those who created the problem,” said labour leader Tyree Scott, “in charge of the solution.” Are British Columbians about to do just that?